Adulterated oil mafia increasing.doing Adulteration of cooking oils playing games with the lives of innocent people.This danda is in the forefront of the Kamareddy Center.This danda is in the forefront of the Kamareddy Center. Raising harmful oils for health is Rs. 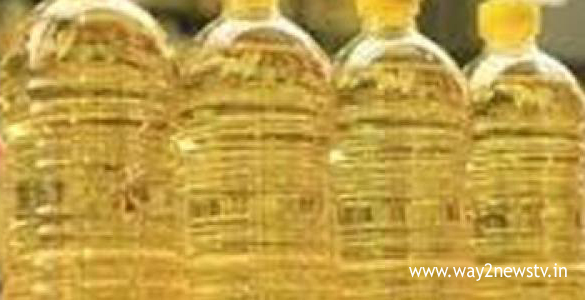 Cooking oils are being manufactured in tanks and at every step of sale. There are many allegations behind the fact that the officers of the respective departments have been guilty of continuing illegal activities in the Rs. Innocent people using these oils are suffering from a variety of illnesses. Licenses should be taken from Gazetted Food Inspector's office to make oils. No plant in Nizamabad and Kamareddy districts has been granted licenses from the Inspectorate of Foods. Only 23 plants have been licensed for packing cooking oils. But Kamareddy and mixing oil in Nizamabad. Most of the oil danda kamareddy is going to be the center of the rice. The health of the innocent people has been questionable as the FSMA guidelines have been delayed. There are no details on the packets that are made of packets. What kind of oils are included in the packet. The details of the manufacture of oil, packing date .. The details of the plant should be printed on the packets with full details such as other chemicals. This adulterant danda has been miraculously affected by the recent woes of Kamareddy. The oil packet of these undeveloped packets is being purchased and the lives of the innocent people are coming. According to the rules, traders do not sell lounge oil. Ya "free lounge oils are going on. In the rural and remote areas, the lukewood is being sold to the people's innocence. Cheaper oils are combined with over Rs. Palmolive and cottonseed oil are cheaper. These oils made from cotton-made beans are imported from ginger oil mills like Adilabad and Bhimsa. Tens of thousands of tankers are getting. These cheap oils are packaged with nicknamed pulley oil and sunflower oils. These packets are beautifully painted with pulses and sunflower seeds, which are priced at the expense of innocent pulse oil and sunflower oil. The innocent people are not aware of the English translation of the packet because it is the same pulley and sunflower oil that they see in the picture. This is not just in the packets but also packing the oil in the cans. The oil bins of 15 kg are also freely transported to other districts from here. This danda is going in crores of rupees.